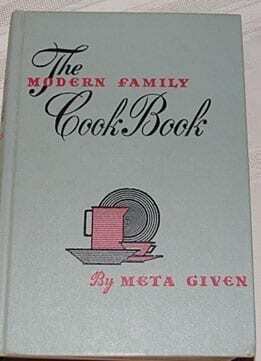 1953 Modern Family Cook Book: Like-new condition! New revised edition, previously published in 1942. By Meta Given, of course. Published by J.G Ferguson and Associates, Chicago, 1953. Hard cover book. 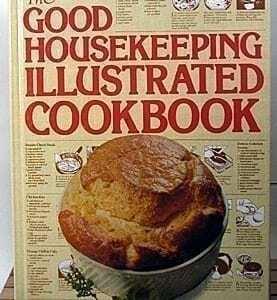 Extremely comprehensive including sections on “stretching the dollar,” “The Family Hostess’ Creed,” food values, etc. 938 pp. Book is in nearly like-new condition. The top of the spine cover has been dinged, but the rest of the book is in like-new, never read condition. NO dust jacket. Yes, this is the cookbook with the menus! 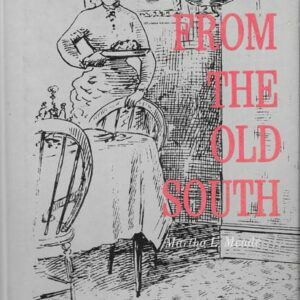 (Marked down from $40.00.) The dust jacket is a mess, while the book looks like it was never opened. An excellent example of a cookbook’s getting shelf wear at in the kitchen. 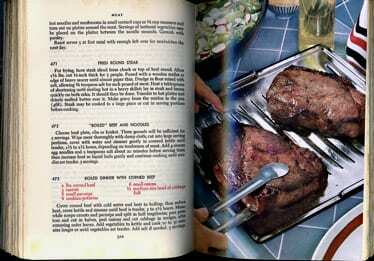 1953 Modern Family Cook Book: Like-new condition! New revised edition, previously published in 1942. By Meta Given, of course. Published by J.G Ferguson and Associates, Chicago, 1953. Hard cover book. Extremely comprehensive including sections on “stretching the dollar,” “The Family Hostess’ Creed,” food values, etc. 938 pp. Book is in nearly like-new condition. The top of the spine cover has been dinged, but the rest of the book is in like-new, never read condition. NO dust jacket. 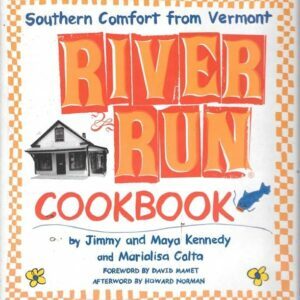 Yes, this is the cookbook with the menus! (Marked down from $40.00.) An excellent example of a cookbook’s getting shelf wear at in the kitchen.